Last night, we sought out the warung dining experience. A warung is a small family-run shop in Indonesia. Most commonly, they’re tiny restaurants, but the word can also refer to small coffee shops, internet cafes, or even phone booths. 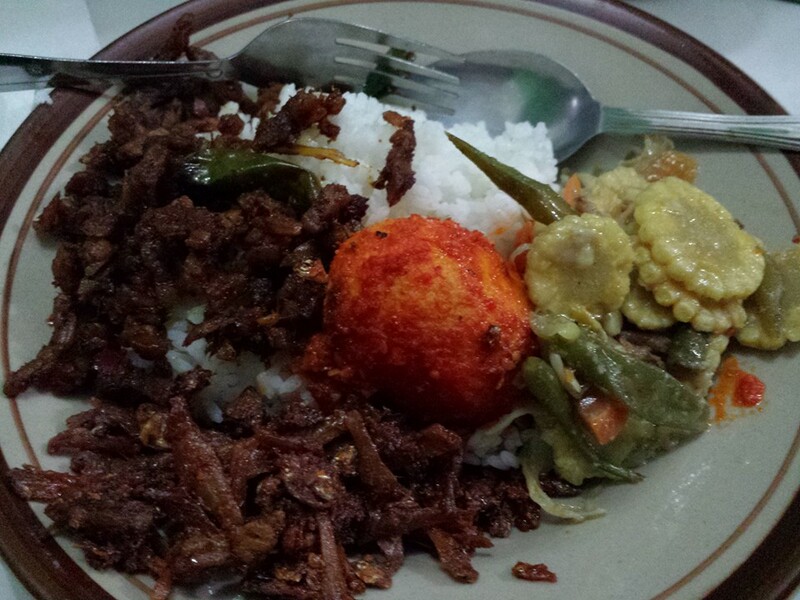 From what I can tell, there are sort of three types of commercially served food in Indonesia. At the bottom of the ladder are the gerobak makanan. These are little hand carts where a man or woman sell a single type of thing. So far, I’ve seen some that sell fried egg rolls, some that sell pieces of fruit, some that sell fried rice (nasi goreng), and so on. I’m not sure how you could make a whole meal on this stuff. I think you’d have to go to multiple carts to do that. So these seem most suited to getting just a snack. The nice thing about these carts is that the owner can just push them around to wherever business is best. They’re all over in Jakarta, probably one every 100 meters or less. In the middle are the warungs, as I already mentioned. They hold a half dozen to a dozen people and are more permanent. They have a place to sit down, even if it’s just on a stool on the side of the road. And at the top are restaurants, where you go in, sit down, and get served by a wait staff. These usually have a menu (though stay tuned for the story of our visit to one that didn’t). The Indonesian word is “restoran” which I’m guessing is taken from the Dutch word “restaurant” which looks a whole lot like the English word “restaurant”. Anyhow, Beth and I had been wanting to visit a real warung, so we went out in search of one. And when we found one called “007” we had to try it (the new James Bond movie, “Spectre”, was released yesterday). There was a sign pointing down a long narrow walkway. We walked, and then there it was. It held about six people, maybe eight in a pinch. There was an array of dishes behind glass, and an L-shaped bench and counter around the display. There were no signs showing what anything was called, or what they contained, or how much they cost. Fortunately, we sat next to a young woman with fairly good English skills, and she was our savior. She interpreted between us and the warung proprietress. This style of warung is a “warung nasi” meaning that you get a plate with a scoop of rice (rice is “nasi”) and then order other stuff to go on top. We didn’t know how to order, but the young woman — clearly of the internet generation — explained, “You just point and click.” So we just pointed at what we wanted. Beth got a few items on her rice, and I got a few slightly different ones. A lot of the food was based on tempeh, one of two words that our impromptu interpreter couldn’t translate but I knew because they’re shared with English. The other was soursop, which in Indonesian is “sirsak”. Beth’s photo of her plate. I had the same veggies (the corn and beans) but had a really good tempeh dish instead of the egg, and also a tofu thing much like agedashi instead of the tiny dried-and-fried minnows. It was a bit awkward, but everyone had a good time. The girl seemed to enjoy helping us figure out what to eat, we got a good and very authentic meal, and all the other patrons got to giggle at the funny American tourists. I asked our interpreter where she worked, and learned she works at the front desk of a nearby hotel. That explains why her English is pretty good (and presumably why she was so helpful). Side Note 1: The next day, after lunch, we were walking toward the supermarket, which is next door to this hotel. Beth recognized the girl at the front desk, so we went in to say hi. It was a funny little meeting. Even in this huge city of 11 million, it can be a small world! Beth tried to explain that she was going to the Cat Cabin, which nobody around here seems to have even heard of. The desk clerk didn’t know the word “cat” or “cabin” or “kitty” so I did a pantomime of a cat — “meow, meow” with my paws up in the air — and then she got it, though I think she felt we were a little crazy to pay money to go see and touch cats. Side Note 2: To my knowledge, there is only one Malaysian or Indonesian food restaurant in all of Denver, and that’s a place called Makan. Beth and I went there a few years ago, and I wasn’t really impressed. But now that I’m learning more Indonesian (which is essentially a dialect of Malaysian) I learned that “makan” just means “eat”. Similarly “makanan” means “food” or “that which is eaten”. It’s a stroke of marketing genius to name your ethnic restaurant “eat” in the language you’re representing. What do you want to do? Eat. Where do you want to eat? Eat. “Masakan” means cuisine, by the way, though I won’t hazard a guess as to whether makan, makanan, and masakan all share the same root word. Here is the receipt from our meal. Given the current exchange rate, this receipt is about $2.28 in US dollars. That’s a good price for two plates of hot food and two cold drinks! And that’s how you can tell this place is “real” Indonesia, not one of the dozens of targeted-at-westerners restaurants in Kemang. For an idea of how hard it is to keep prices in perspective, we went out to an authentic Irish pub after dinner, for drinks. We each had two drinks. 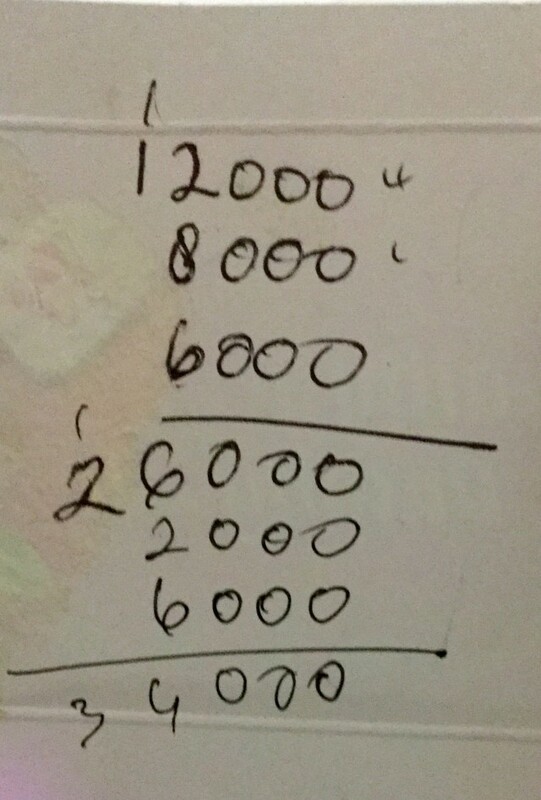 The bill came to over 10x this amount. Imagine going out on an inexpensive dinner date in Denver, maybe burritos or something for $20. And then in 30 minutes you and your date spend $250 for margaritas afterward. Prices are so topsy-turvy in Indonesia. 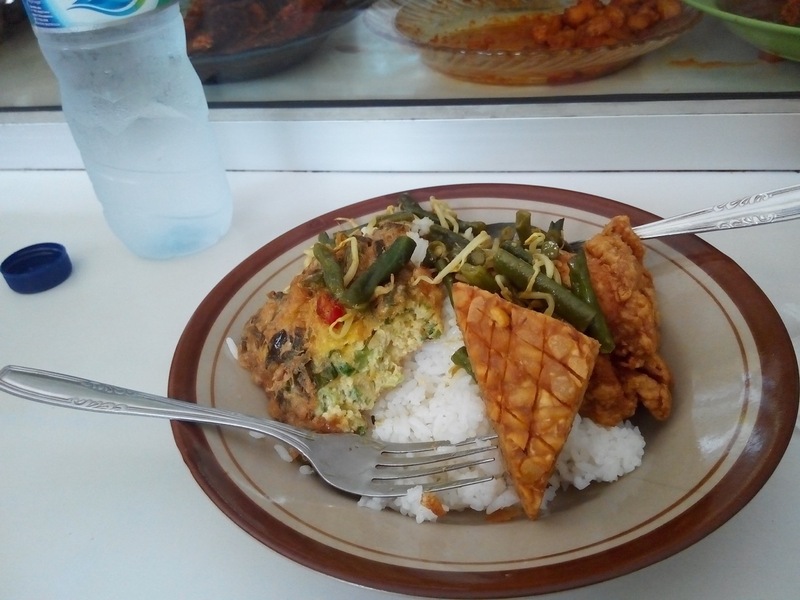 Beth and I went back to Warung Nasi 007 for lunch today. The hotel clerk who helped us the first time was right; the food selection is better during the day. In addition to many of the same dishes we saw Friday at supper time, on Sunday at lunch there were also about four different preparations of whole fish, an eggplant dish, and fried chicken. We used the “point and click” method to order what we wanted on our rice. Here’s a photo of what I ended up with. It’s an egg and vegetable fritter, some green beans, a piece of fried chicken, and a tempeh triangle. I had a bottle of cold water to go with it. Beth ordered more items on top of her rice. I guess she was hungrier. I regretted not taking some photos Friday night, so I snapped a few today. 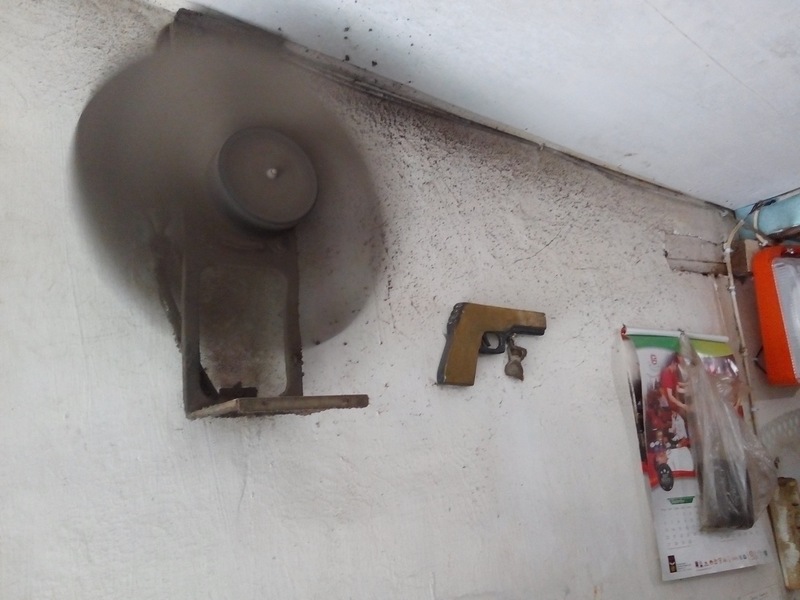 Below is the ultra dingy fan on the wall, along with the toy gun that, I guess, gives it the 007 flair. 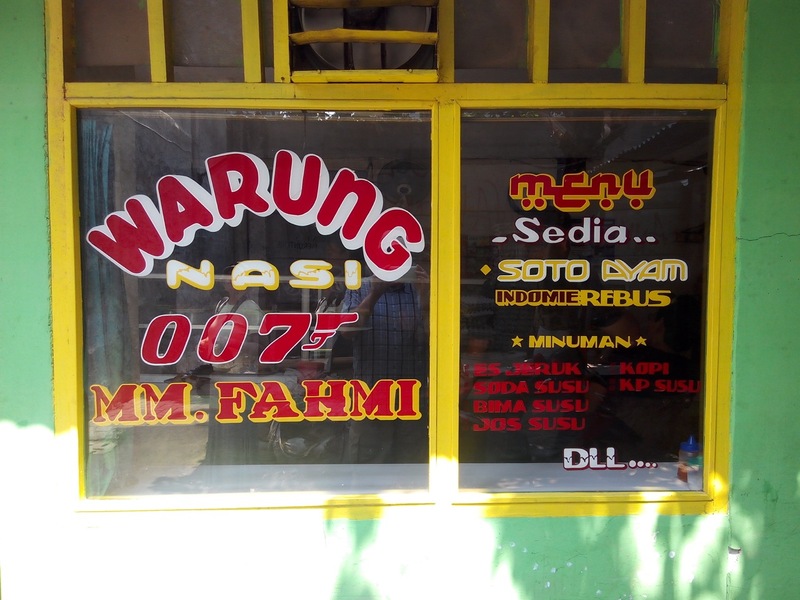 And here is a shot of the window to the warung (and me in the reflection). JOS SUSU – I don’t know this one either. Could it mean JUS SUSU, which would be “juice milk”? After eating, I grabbed one of these weird looking things. They’re kept in a big metal container with a lid. I had no idea what it was, but I figured I should try it. On the way out, I asked what it’s called. “Kerupuk” is the answer, but I didn’t know what it means. 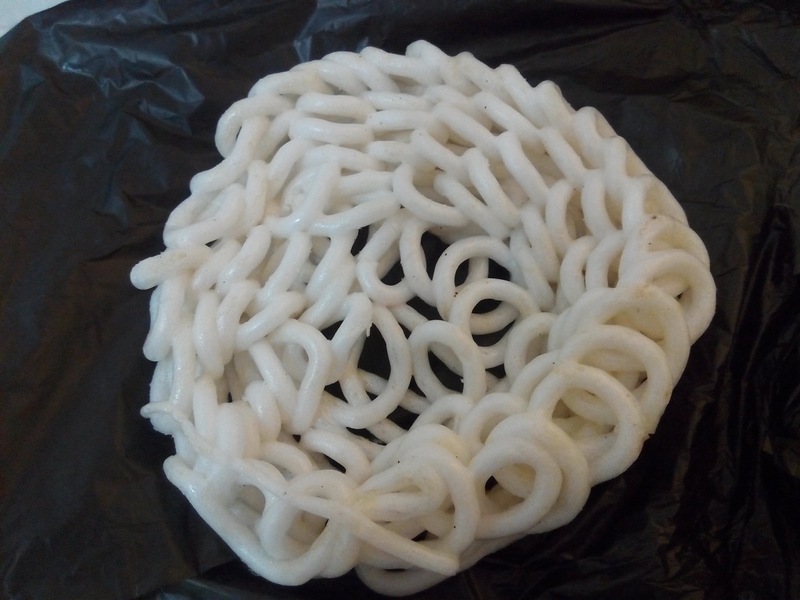 Thanks to Google, I’ve since learned it “kerupuk” is a cracker, and this particular type is a kerupuk kampung. That means it’s made of tapioca starch that’s been seasoned (probably with salt and finely ground dried shrimp) and then fried. Apparently, these crackers are traditionally served on top of soto ayam, the chicken soup mentioned in the window! Ah, so that explains a few things. Beth and I ate the cracker by itself (it was tasty), but it’s meant to go with a bowl of soup. And now, the damage. 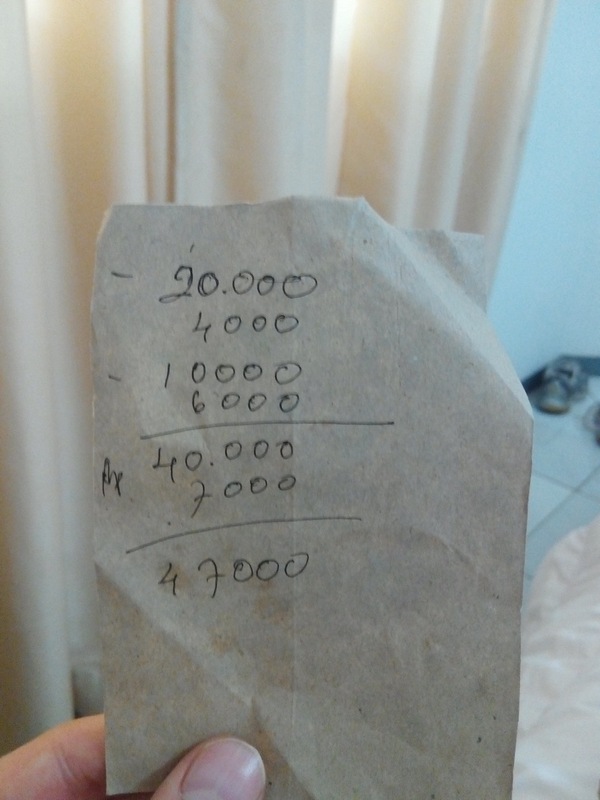 Today’s lunch cost 47,000 rupiah, significantly more than the 34,000 we spent on supper Friday night. I guess some of that is due to the kerupuk and bottle of fizzy orange drink I took with me to go. That’s $3.46, according to today’s exchange rate. As predicted, that’s about 1/6 what we spent for our Western style breakfast this morning. Also, I just learned I was totally wrong about the new Bond movie. It doesn’t come out until November 6, in the US at least.